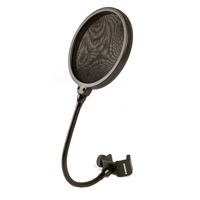 Dual layer 4.75" nylon mesh screen reduces vocal popping ("P-Pops") and sibilance. Flexible 8" gooseneck for easily adjusting filter position. Universal mic stand adapter.